The book's example code is now on GitHub! You can order the book directly from Peachpit Press or from your favorite bookseller. After absorbing the lessons in this book, you'll leave behind old-school workflows and start working in ways that are uniquely suited to today's multi-platform web. 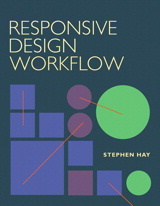 Native Californian Stephen Hay has been living and working in the Netherlands since 1992, and he's been designing for the web since 1995. His roots as a designer and art director in corporate identity, packaging design, and advertising served as a foundation for his current work as a web design and development strategist through his own user experience consultancy, Zero Interface. Stephen speaks at industry events and writes about CSS, web accessibility, open web standards, and design. The book's example code is available on GitHub.